Every day one of our Bible teachers selects a quote to add to the announcements scrolling on the TV screens around our school. I often read the quote as I walk the halls, appreciate the wisdom it contains, and continue about my day. I wasn’t sure of the intent of the quote, but I could easily see it being taken as meaning “you should not have any doubts.” I saw this as problematic because we survey our students every year to see where they are spiritually, and we regularly find that our students do, in fact, doubt. I worried that telling students that “[their] doubt can create mountains” might suggest to them that, if they doubt, they are in the minority, that our school was not a place for them to raise their doubts, or that the act of doubting itself suggested something about the strength of their faith. I wondered where we stood on helping students through their doubts. Isn’t unaddressed doubt more of a mountain than doubt itself? Isn’t faith made stronger through reassurance provided in the face of doubt? He said that he acknowledges the normalcy of questioning and doubt as well as what to do with it. He makes time in his classes for students to bring up specific struggles or “questions we never get answers to.” He calls these questions “ceiling fan questions,” or questions that keep his students awake at night, staring at the ceiling fan. Eventually he moves the conversation from healthy doubt and questioning to caution (the “asterisk” that should accompany doubt). He explains to his students that “doubt, left to itself, can be harmful to faith. A question asked, without pursuit of truth, can be a breeding ground for skepticism and potential cynicism.” As our discussion about doubt continued over the next few days, he pointed me to a few passages of Scripture to consider: Matthew 14:31, Matthew 21:21, Mark 11:23, Mark 16:14, and James 1:6. 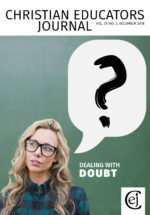 As I studied these passages with an eye to what they said about doubt, I saw a pattern in how Jesus handled those who doubted: He acknowledged the doubts of His disciples; He asked them why they doubted; He explained what was possible when they trusted fully in Him; and then He presented Himself to them even while they still doubted. The more I thought about it, I wondered if our Bible teacher wasn’t modeling this very same approach with his students: he was engaging their doubts in class, asking them why they doubted, showing them that they can overcome those doubts if they continue to pursue truth, and reminding them that Jesus will be there for them even when they doubt. Given that only the juniors had this context, this teacher decided to take the quote off the screens. I appreciated his decision to do so, but I also appreciated that our students had someone like this teacher to help them navigate their doubts. My hope is that this issue of the CEJ will similarly help other Christian educators who are walking alongside doubting students or who may not know what to do with their own doubts.